What do Home Staging and Holiday Rental have in common? If you didn’t answer “well, everything!”, then this article is for you. Not only holiday lettings are an amazing market for a home stager, but a holiday listing owner does need staging advice and measures to be taken in order to make a profitable business out of their property. The rise of holiday rental platforms have made it easier than ever to let a holiday home. You just have to make sure your property appeals to your audience and stands out from the competition. According to Karen Spencer, founder of The Business of Holiday Rental, your property has to look amazing online to get guests to book and it has to look gorgeous offline too, when guests arrive there in person. Creating a quality holiday rental means that it needs to look better than ‘average’. Coming up with that “wow” factor starts with working with what you already have and creating stylish interiors following some easy styling rules. And if anyone knows about wow factor and styling rules within holiday rentals, that one is Karen Spencer. The founder of The Business of Holiday Rental works with holiday home owners to help them earn more from their investment; by maximising the potential in their holiday rental. This includes how to style and present their holiday home to stand out from the crowd and get more bookings as a result. As well as some marketing tips, pricing strategies and some business advice thrown in. Karen has been involved in the industry for over 10 years, and it all started when she worked for a luxury holiday letting agency. That was really valuable experience which she still draws on today. She wanted in! 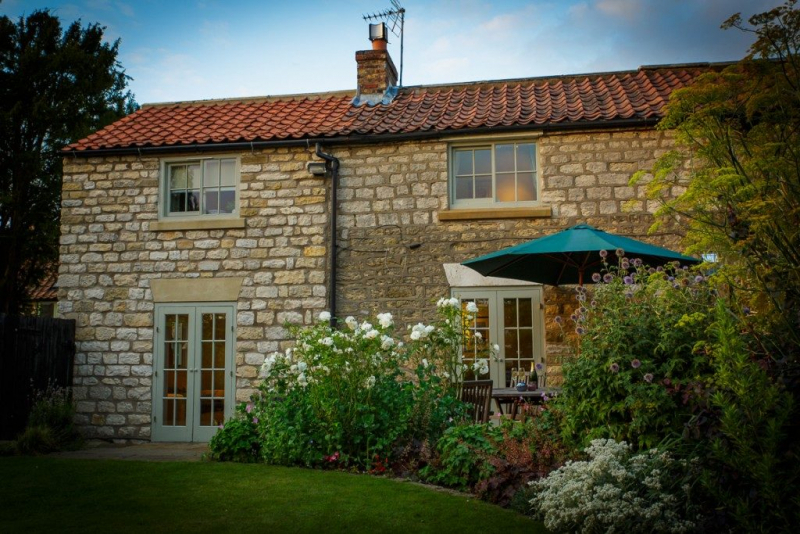 In 2007 she bought her own holiday cottage, Spring Cottage in North Yorkshire (click here to have a sneak peek). And she knew she wanted to create a special cottage, one that was worthy of charging more per booking and would help her maximise her profits. However, like many holiday renters, Karen also had to work to a budget. It wasn’t about ripping everything out. She had always had in interest in interior design so she took a course to become a home stager to make sure she got it right. Lucky for us and for many homeowners, The Business of Holiday Rental was set up as Karen wanted to share her industry knowledge and styling know-how with other owners, to empower them to earn more. We spoke to Karen to understand more about her business and how she help homeowners with her styling tips and marketing knowledge. Home Staging Association: What services do you offer? Karen Spencer: I’m an online business. Styling Wow - £149 – where owners get my styling attention on their holiday home. We chat and I gather ideas and get to know them and their holiday home. I’ll then go away and do some research and thinking about what will work and what they need to do next. Always with a budget in mind. I’ll then deliver my bespoke, step-by-step, easy to follow advice in a video recording for you to work through. Styling Review - £49 – this is a quick fix. I’ll look at your website and will look objectively at what’s working and what you need to change and what can be done quickly and easily right there and now. HSA: Which one is the most popular one? KS: Styling Review is a popular option as owners like the quick fixes it gives them. The changes a few tweaks can make to the way a room looks is amazing. And my Super-Duper Charge Your Holiday Home’s Marketing – whenever I open the doors to that, the places are snapped up quickly. It’s for owners who want to take control of their own marketing and not rely on the big listing sites. HSA: In your opinion, what are the key elements in creating a really special holiday house? KS: It’s all about the detail. I say “furnish your holiday rental as you would your own home”. Think of the small things eg liquid soaps by each basin, a box of tissues in the lounge, a picnic blanket. All items that don’t cost much but make a difference to your guests’ stay. When it comes to styling, it’s about creating an environment that’s homely. But that doesn’t mean family photos and lots of ornaments! It means not being bland and sterile. It means adding warmth into a room by colours and textures and low-level lighting for cosy nights in. HSA: What are the most common decor mistakes people do when letting their holiday houses? KS: All walls painted in magnolia and orange pine as the furniture of choice. And I understand why this happens. Owners think that magnolia appeals to the biggest number of guests. Instead all it does is make their property blend in with all the other magnolia properties. I’m a fan of a neutral backdrop in a holiday home but there’s a difference between neutral and bland. As for orange pine, it’s cheap to buy. And it looks cheap. It doesn’t say “I’m a quality holiday rental”. Owners don’t need top quality pieces of furniture but it needs to look good. I’d point owners towards oak as a good all-rounder, fitting into most schemes and available cheaply from various online warehouses. Or if you have a quality piece of furniture, upcycle it by stripping it and /or painting it. HSA: On your Guide to Building a Profitable Holiday Rental Business you help property owners to create that "wow" factor. Can you explain how can they achieve that? And what are the main challenges you've noticed they encounter in the process? KS: I ask owners to look at each space objectively. What is the focal point in that space? If it doesn’t have one, then create one. This can be something as simple as painting the wall above a bed a different colour to the rest of the room or adding a special piece of art to a wall. It might be re-arranging the furniture to make the patio doors onto the garden the focal point. I also ask them to look at their colour scheme. Does one exist? Keep flooring and large pieces of furniture neutral but add an accent colour via the rugs, curtains, cushions. Something that will make their property stand out online for all the right reasons. Owners are concerned that they’re going to be asked to pay shed-loads to restyle a room and it won’t be worth it. I disagree, it’s amazing what you can find on the high street. And if your holiday home is beautifully styled and presented it immediately shouts quality. And guests are prepared to pay for quality! Once I show holiday home owners how many styling improvements can be made by tweaking what they’ve already got, using proven home staging techniques, then they get it. Convincing them it doesn’t mean huge spends can initially be tricky. HSA: Do you recommend services such as professional photographers, tradesmen, etc, or is this something the property owners have to seek themselves? KS: I 100% recommend having professional photographs taken. And I recommend staging the property first with props such as fruit in the fruit bowl, a glass of wine on the patio and the log fire lit. You’re selling a lifestyle, an escape from everyday life. Your own snaps have a role to play on social media but you’ll use professional images again and again in your marketing and on your website. An investment that you’ll soon get back in terms of bookings! HSA: Do you think holiday homes are an interesting niche to be explored by home stagers? Why? KS: It certainly is. The holiday home industry is part of the rental industry. Home staging principals apply whether you want people to rent your place for a holiday or a six month let. HSA: On your Guide you mention it's not about getting more bookings, but about earning more per booking. How can property owners achieve that? KS: It’s about bringing a quality product to the market. And marketing to those people who appreciate and are willing to pay for quality. I earn approx. 20% more than similar holiday homes in my area by applying this principle. I let others do average. I do special! If you read my Visitor’s Book, my guests will agree! My changeover costs are the same to welcome each set of guests whether I charge £600 or £850 a peak week. I knew from the start I wanted to be the £850 place. And using home staging ideas and techniques played a big part in achieving this. You also need quality in every aspect of the holiday home business. It’s about the owner offering great customer service and caring about their guests’ holiday experience. It’s about going the extra mile to help them and leaving a locally sourced welcome hamper, not charging extra for the wifi or logs. And providing amenities that you’d expect at home, like a dishwasher and a fully stocked kitchen. HSA: What is the best way to get in touch with you? KS: I hang out a lot on Facebook. So please like my Facebook page so you don’t miss any of the holiday home tips and advice I share on there. And on my website I have some fabulous free resources available to download. Check them out here and get downloading.